At least a handful of cafes open in New York City every month, but I no longer attempt to make it to all of them and instead prioritize those that meet at least one of the following criteria: serving coffee from a favorite roaster, beautiful spaces, good places to work, inhabiting previously unserved or underserved neighborhoods. My four recent favorites are all in Brooklyn except for Flatiron’s Patisserie Chanson. As if it always existed, East One Coffee Roasters has been full from the get-go, with laptop campers and moms in equal measure making use of the reliable wifi and variety of seating options. Apparently the corner of Carroll and Court Streets had pent up demand for an operation of this type, with its specialty coffee, full bar, beer and wine, and pastries in the front, and a full service restaurant in the back. Utilizing the first Slayer Steam in New York City, East One, a collaboration between two London cafe owners, produces thick, bright espresso and good filter coffee using beans sourced from Gowanus neighbors Crop to Cup and roasted in-house. 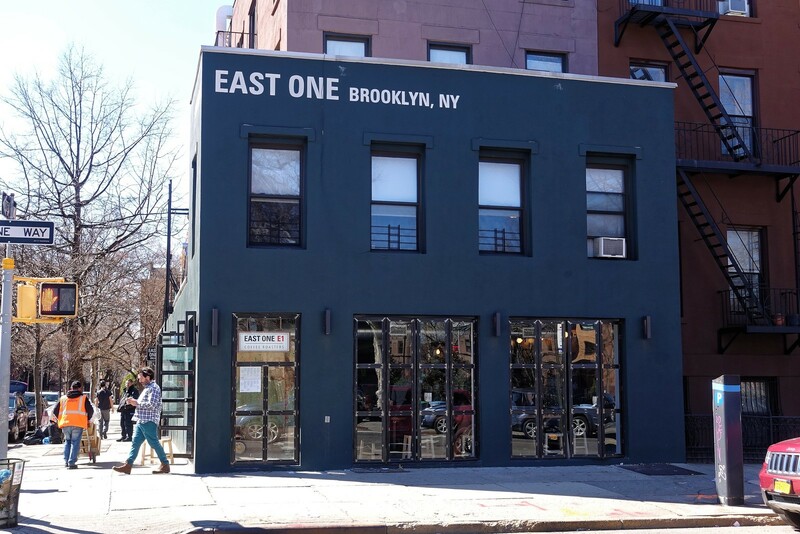 The exterior makes its mark, a two story black-painted building proclaiming the name East One in huge white letters, but the interior of the under-done front area comes across as barebones rather than minimalistic – more rec room than industrial chic. However, the design makes more sense when considered as a continuation of the gorgeous full service restaurant that extends down the Carroll Street side, in a one-story building behind the cafe, and shares space with their glassed-in Diedrich coffee roaster. 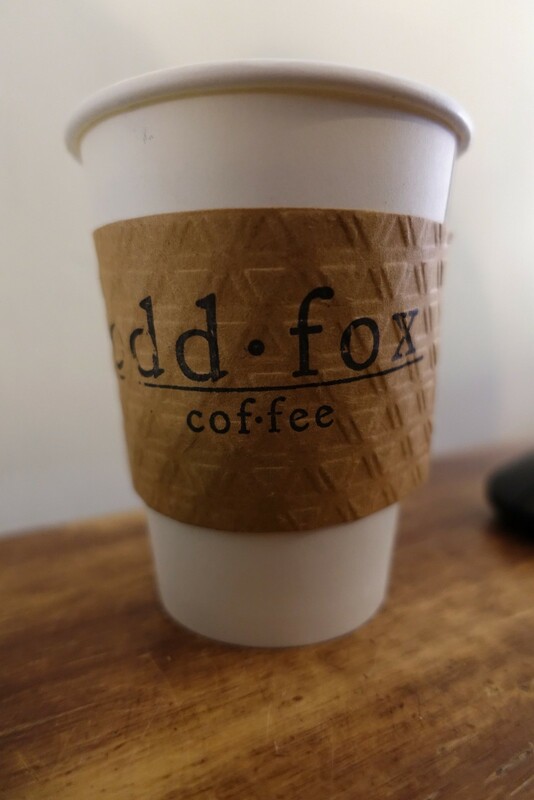 Odd Fox is a drop-in replacement for Propeller Coffee albeit with a new owner and a redone exterior – it’s sad that they painted over the Beata Delicatessen signage. They’ve kept the vintage demitasse spoons, and the space retains its calm living room feeling. In addition to coffee drinks there is canned upscale lemonade and a familiar slate of pastries. The coffee is still Parlor, served with a smile; the espresso is generally well-pulled and often delicious, and drip coffee is better than average. Free wifi and some plugs, although the wifi labors when there’s a full house, which is often. They close early, 4pm, on weekdays, with longer hours on weekends. 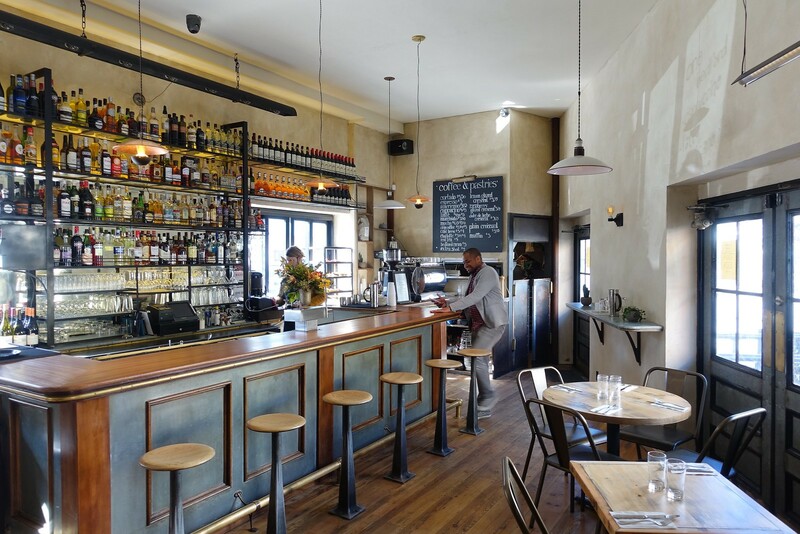 Behind a nondescript brick coat wall on the Bedford Ave side of the triangle it forms with Nassau Ave, where Williamsburg passes into Greenpoint, lies the attractive, all-day French brasserie, One Bedford. Beautiful accents abound, from the steel wall with inset, colored, patterned glass blocks to the backlit open bar shelves arrayed with liquor bottles. The espresso, from Southside Williamsburg roaster Devoción, needs work on the pulling side, but there were possibly some roast defects as well. For pastries choose from a variety of large, over-sweet, filled crescents (croissants) with flavored glazing – lemon, dulce du leche, or raspberry. Chanson, a modern French patisserie from former Hakkasan pastry chef Rory Macdonald, won’t want for customers, sitting as it does across 23rd St from Eataly. Glass cake stands perch on front counters and display eye-catching, colorful, fanciful cakes and tarts including some which, in their perfection, appear to have been 3-D printed; this place was built from the ground up with Instagram in mind. 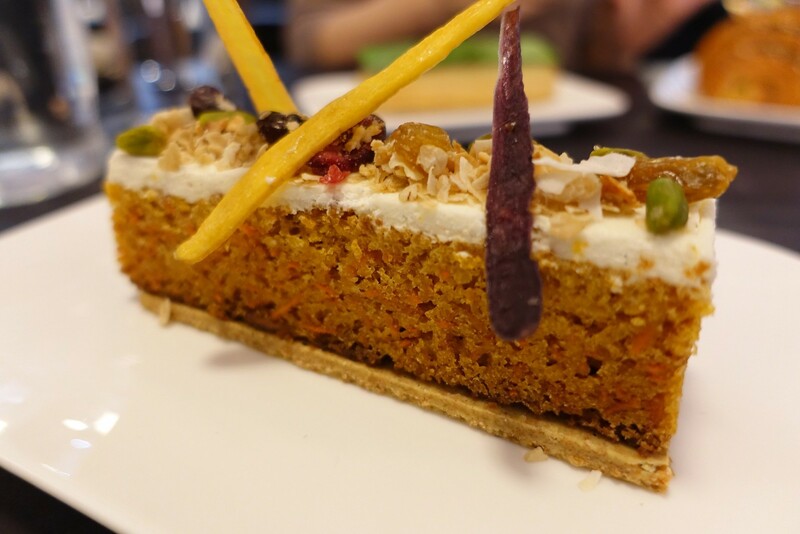 Some signature creations, such as his carrot cake, make it into the lineup, along with a whole slew of other options including cakes, pastries, croissants, bread, and food. The basement level of this ambitious, two-story sweets emporium is reserved for customers partaking of the nighttime dessert tasting menu, but there are plenty of options for denizens of the daytime. Customers can sample all savory and sweet creations in the ground floor sit-down cafe in the rear of the space; the front is given over to a la carte offerings including wrapped sandwiches, pastries, bread and coffee drinks generated at the coffee bar using Stumptown Coffee. I’ve sampled a variety of Chanson’s sweets over a few visits, including many of the cakes, most of the eclairs, and some macarons, and found most of the offerings to be over-sweet for my taste. Croissants, however, are wonderful – flaky, buttery, and delicious.